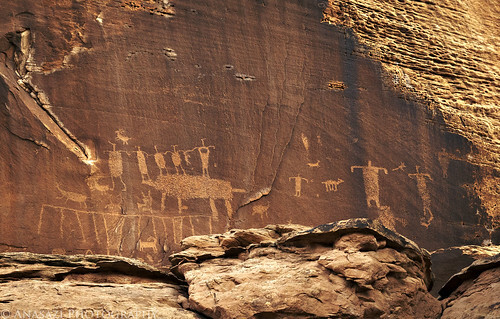 Here’s a very interesting petroglyph panel my friend Jackson spotted as we hiked and searched for rock art near Moab on Saturday. This panel is located very high up on a canyon wall, well above the canyon floor. We did try to find a way up to it, but were unsuccessful, so this photo was taken with my long lens from the canyon floor. One of the more unusual figures found in this panel is the large bird-like figure found in the lower left that appears to have outstretched wings. I’ve never seen anything like that before. Above the bird-like figure there is another large four-legged creature that could possibly represent a bear?